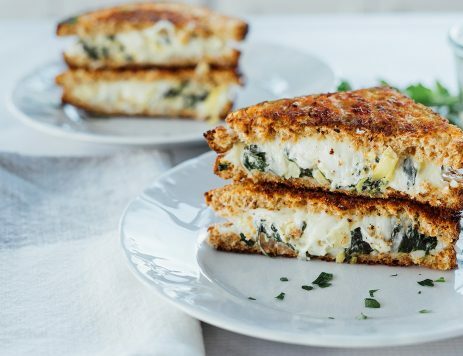 Grilled Cheese Recipe with Gruyere & Spinach | What’s for Dinner? 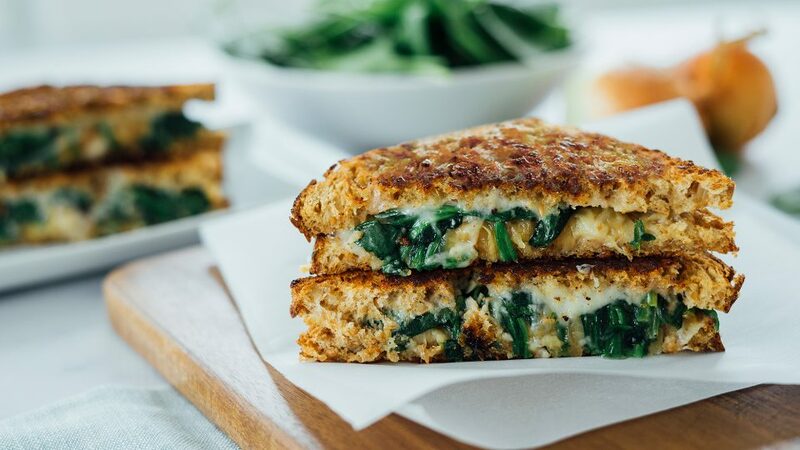 Featuring Gruyere, baby spinach, browned onions, and Angelic Bakehouse® 7-Grain Bread, this grilled cheese recipes adds a sophisticated spin on a classic. Melt 1 tablespoon of butter in a medium skillet over medium-low heat. Slice onions very thin and add to pan. Season with salt and cook, stirring occasionally until onions are golden brown, about 20 to 30 minutes. To prevent burning, add a few tablespoons of water to the pan while cooking and stir. Remove onions from pan and set aside. Heat oil in the same pan over medium heat. Add garlic and cook until fragrant, about 30 seconds. Add spinach and toss to coat with oil and garlic. Season with salt and pepper and cook until just wilted and bright green, about 2 to 3 minutes. Remove from pan and set aside. Place 8 slices of bread on a work surface or cutting board. Spread vinaigrette on each slice and top 4 slices with Gruyere, caramelized onions, sauteed spinach, more Gruyere, and a second slice of bread with vinaigrette-side facing down. Heat skillet over medium heat and coat bottom of skillet with butter. 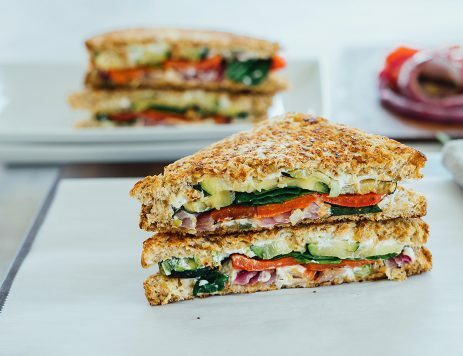 Cook two sandwiches at a time until cheese is melted, about 2 to 3 minutes per side. Lightly butter the top slice of bread and flip to cook the other side.